It’s a modest goal, but I’d like to finish the knee high Kalajokis for Bendigo this year. It’s probably more accurate to say start *and* finish as I haven’t started the Patonyle versions yet. In fact, the Allegro ones are still sitting on my desk waiting to be frogged. These things take time! Before starting the Kalajokis, I should finish my stripy knee highs. Not that there’s too much to go now; I’m currently half way through the increases on the second sock. The increases on the first sock felt so slow, but on the second sock they signal the downhill run so they’re flying by. By sheer coincidence, the Noro stripes match up almost perfectly. I’d been mentally preparing for a pair of fraternal twin socks, but here I am with a pair of almost identical twins. Silly as it is, I feel almost let down that they’re turning out perfect. Last but not least, thank you everyone for your lovely comments about my vest. You’ve motivated me to not only try wearing it again, but to also start thinking about possible colour combinations for another vest. I could rip back part of the original vest and fix up the problems, but I want to keep it in its slightly dinky state. Making another one, a sort of do over, seems a pretty good compromise to me. A pair of knee high socks from start to finish in a month? I foresee monogamous knitting in the near future! 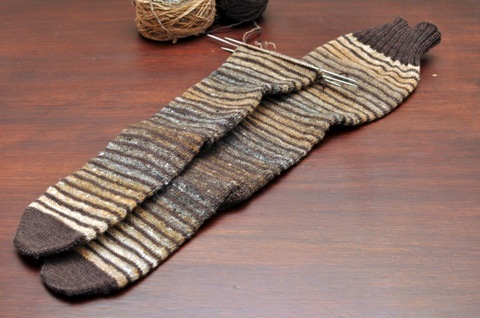 ooh, I love striping socks when one yarn is variegated! they will be stunning, and there’s nothing like Bendigo looming to inspire finishing! I think that’s a reasonable ambition! Isn’t Bendigo great for the showing off of our knitwear? i just love the way these socks are turning out. sometimes a deadline (and the fear of freezing) are very good motivators for project completion! Those socks are absolutely beautiful, can’t wait to see them on!